And Ideal home base for exploring the myriad of fun things to do in Americas playground, this one bedroom, one-bathroom oceanfront condo is also the ideal home base for lying on the beach and doing absolutely nothing. Up to six guests can enjoy all the comforts of home in this condo. The unit offers a king-size bed, a double Murphy bed and a sleeper sofa. The Oceanfront balcony is the perfect place to relax at the end of the day, with free wi-fi throughout the resort making it a great place to pull out the laptop, tablet or smart phone to stay connected during your vacation. There’s a full kitchen that includes a stove, refrigerator, microwave and a dishwasher along with cookware and utensils. Th condo also offers the convenience of a in unit washer and dryer. Amenities that guests enjoy while vacationing at Holiday Sands are; and indoor and outdoor pool, lazy river and a fitness center to stay in shape while your away! In an area full of great restaurants, sine within walking distance distances. Include the resorts very own Ocean View café as well the Compass Rose Restaurant and the Crow’s Nest oceanfront Bar7 Grill. Other nearby spots to eat include Angus Steakhouse and Seafood, E-Noodle and Krispy Kreme Doughnuts. 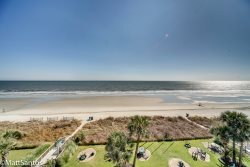 Popular attractions nearby include the Spring Maid Pier, Myrtle Beach State Park and the Burroughs-Chapin Art Museum. So, come enjoy your stay at the Holiday Sands!